The 1839 race has been come to known as the first "Grand National" there could be a few reasons for this. The first of which is that the three previous races were said to have been held at Maghull rather than at Aintree. There has been much debate over this and I think personally that the races were held at Aintree but where they were held is not really most important thing it's the race that is the most important thing. Secondly the name of the race was changed in 1839 to read "The Grand Liverpool Steeplechase" from "The Great Liverpool chase" as it was known in 1836 and 1837 and simply A sweepstakes of 10 sovs before that. Well this does not stand up either as the race Changed it's name many times 1843 "The Liverpool and National Handicap Steeplechase and then 1844 The Liverpool and National Steeplechase before settling on "The Grand National handicap Steeplechase" in 1847. What ever the reasons for calling this the first Grand National we will refer to it at the first official Grand National and for many of the references on the site it will be classed as the first as the record books record it as the first and it may get confusing when we start referring to the 50th or 100th Grand National. So this 1839 Grand National will be the starting point for the timings and stats of future Grand Nationals. It would seem by now that Mr. Lynn has dropped into the background at this time and there were reports of his failing health and also his finances were failing, but for whatever reasons the 1839 race now had a syndicate of trustees who were: - Lord Stanley, Sir Thomas Massey Stanley and Messers Aspinall, Earle and Blundell. And members of the race committee were the Earls of Derby, Sefton, Eglinton and Wilton. Lords George Bentinck, Stanley and Robert Grosvenor; Sirs Gerard, Thomas Massey Stanley and R.W.Bulkeley; the hon. E.M Lloyd Mostyn and Mr. E.G.Hornby. 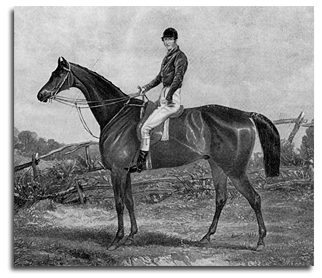 All this of course adds to the weight of the race and is another reason for the 1839 race being classed as the First Grand National. A sweepstakes of 20 sovs each, 5 forfeit, with 100 added; 12st each, gentlemen riders, four miles across country, the second to save his stake and the winner to pay 10 sovs towards expenses, no rider to open a gate or ride through a gateway, or more than 100 yards along any road footpath or driftway. The entries for the race showed that the race was well supported with over 50 horses still entered in the few days before the race. However on the day 17 (or maybe 18 as there have been reports of Jerry running in this race) went to post. It would seem that the betting was hot on the day with Lottery, The Nun, Rust and Daxon at the head of the market. The race was started at 3pm. And the horses ran away quickly with Conrad ridden by Captain Becher and Daxon ridden by Mr. T Ferguson were first away and soon opened up a gap between them and the rest of the field. The race went on through some fields and the first obstacle was a deep ditch in front with a high bank. This did not cause any problems for the horses or riders. Soon they were into deeply ploughed fields but this also gave no problems. On to the next high bank into a grassed field. After this they went on to the first difficult fence, first there was a fence then a rough high jagged fence and then d six foot wide ditch. Captain Becher was soon at the fence but his horse Conrad hit the fence and rolled over into the brook throwing his rider into the brook, and so was born the most famous fence in the world Bechers Brook. There was also another faller at this fence. Lottery cleared the fence along with Seventy Four and The Nun and these lead the field of runners on. Captain Becher was soon out of the ditch and reunited with Conrad and sped after the field of runners. The riders ran on through the corner of a meadow with the Captain in pursuit. Turning at right angles and then into pastured field and then over a hedge into another ploughed field, meanwhile Captain Becher was now not just up with the runners but passing many. Soon they were at the next difficult obstacle a high hedge bank with rails and another water ditch which was six feet lower than the take off. By this point Captain Becher was again at the head of the field of runners. The Captain was again to be unlucky when his mount Conrad cashed through the fence throwing him into the ditch again and then gave him the indignity of rolling over him and running away, soothe national was over for one of its most famous participants. Rust was next at the obstacle and he also fell but luckily for him his rider Mr. William McDonough caught the horse and remounted. The race continued and the next obstacle to be jumped was a fence where the landing side was higher by four feet in some places, but this did not catch out so many horses. The race continued on with a series of easy obstacles and back to the straight and here there was a very unforgiving obstacle a five foot stone wall. At the obstacle first was Barkston who simple refused to jump the wall at the first attempt and was passed by Lottery who jumped the wall with ease s did The Nun and Paulina. Barkston was given a second chance and this time cleared the fence from what looked like an almost standing start. With the first circuit over it was on for the second circuit with the usual horses falling at the odd fence it was at the second of the water jumps on the second circuit that sadly Dictator ridden by Carlin took a high leap some ten yards before the fence, cleared the fence but crumpled on landing, burst a blood vessel and died almost immediately and became the first horse to die in The Grand National. It was later reported that his back was broken. As the runners turned into the home straight the were a line of hurdles that needed to be jumped before the run in and these were jumped with ease and lottery who was still full of running won the race by three lengths from Seventy Four who was three lengths in front of Paulina and true Blue.